Final residents leaving historic tower blocks due to be demolished but still do not have permanent accommodation. The final residents are leaving Glasgow historic Red Road flats but still have no permanent accommodation. Families began being moved out of the flats in the north of the city earlier this month but no permanent homes have yet been found for the asylum seekers living there. Asylum seekers were facing an uncertain future in December after plans to move them to short-stay rooms at a disused office block were scrapped. The proposed development would have seen 100 individuals and families at flats moving to the city's Possil area. 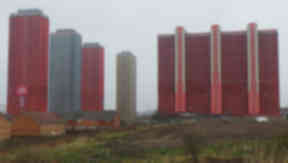 The Red Road flats at Petershill Drive was home to many asylum seekers while their cases are reviewed by the Home Office. Planning permission was sought by security firm Serco to convert the former office block on Balmore Road into short stay accommodation composed of one and two-bedroom flats. However, the plans to move them to a former Scottish Water office block were met with anger by locals and almost 700 objections were lodged. As a result the plans were withdrawn and those affected now face uncertainty about the future of their accommodation. The Home Office has now said residents of the flats are now being relocated to accommodation across the city. A Home Office spokesman said: "All asylum seekers in Petershill Drive will be relocated to alternative accommodation across the Glasgow area. "Our accommodation provider is currently identifying new permanent initial accommodation and we continue to work with them, local partner agencies and Glasgow City Council."